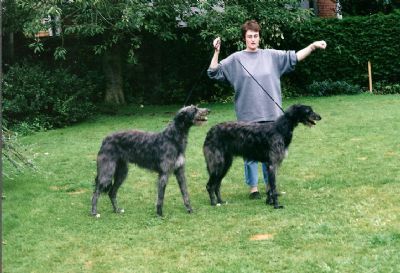 Breesfalt Deerhounds - involved in showing Deerhounds and as occasional Deerhound breeders since 1986. 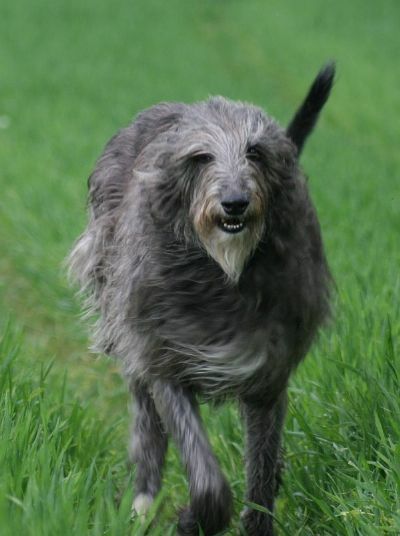 We only breed from our deerhounds occasionally so infrequently have a litter of deerhound puppies available to loving homes. 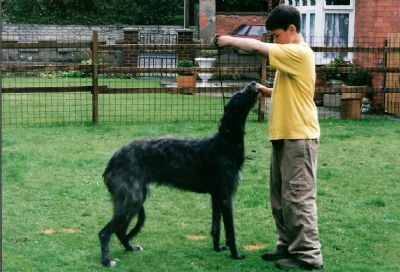 Lily is the dam of Evie and is owned by Belinda Playford, Tillyhilt Deerhounds. She is pictured here being handled by a very young Jake Playford. Lily (right) and her litter sister Ivy (Breesfalt Tillyhilt). I think Belinda may be trying to conduct the orchestra, just outside the range of the picture. Ivy was known as Francesca Double when she lived with me as she was always instigating riots, she was the leader of the rest of the puppies, showing them how to get up to mischief. Ivy was killed in a tragic accident and her life was cut short. However, she lived every minute to the full, as did her mother, Francesca. Lily at 7 1/2 running through the fields.